Increased removal” is how Prime Minister Benjamin Netanyahu, at the weekly cabinet meeting Sunday, called the new policy in which asylum seekers will be required to choose between leaving Israel for Rwanda and being jailed indefinitely. 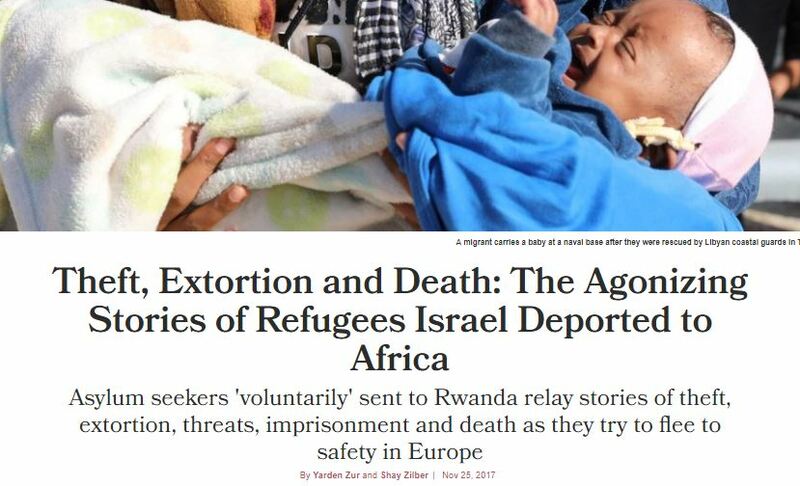 But dozens of statements we gathered in Europe over the past few months from people who “voluntarily” left Israel for Rwanda and Uganda in recent years strengthen what previous reports on the matter found: What the deportees expect to face in Rwanda is the beginning of a journey of human trafficking, torture and in many cases death. The statements, which I collected with Shahar Shoham and Liat Boltzman for research being done in Europe, present an identical picture: In Rwanda, deportees have the transit documents they received in Israel taken away from them. These are the only identity documents they have. A local contact person locks them up in a hotel room and warns that they must leave the country within a few days. Sometimes they are threatened and all their money is stolen from them upon landing. They are transferred to smugglers who, in return for hundreds or sometimes thousands of dollars, send them to Uganda. From there they are transferred in a similar fashion to South Sudan, to Sudan and on to Libya, from where they try to cross the Mediterranean Sea to Europe. Without identity documents, they are often subject to imprisonment by the authorities in various countries. Based on dozens of testimonies and other research, we estimate that hundreds have died in the torture camps in Libya or drowned at sea. We heard a similar story from Dawit (not his real name), whom we met in Berlin. He lived in Israel for five and a half years and worked in a restaurant in Tel Aviv. Like Tesfay, he too is in his mid-twenties. Dawit was pleased to speak Hebrew. After almost a year in Europe, he says he is afraid he will forget the language and misses Israel, even though life was difficult without residency status. In Rwanda, the population authority promised Dawit and his friends, they could get residency and work. So he too got on the plane. What happened from that point on repeats itself in the dozens of other statements we heard: a path paved with danger and death. Among those who died was Dawit’s wife, who was in her second month of pregnancy. In Libya, the smugglers put the asylum seekers on two different boats, and her boat, packed with hundreds of others, sank. When Dawit tells about it, his voice quivers and his forehead becomes covered with sweat. “When I got here I went crazy,” he says. The survivors of Israeli policy whom we met in Europe are among the lucky ones who managed physically to survive the journey, but it is doubtful whether their psychological scars will ever heal. In Germany, where Tesfay and Dawit managed to reach, 99 percent of the Eritreans receive residency status. Eighty-one percent of them received full refugee status in 2016. In other countries too, the percentage of those people from Eritrea recognized as refugees is very high. Despite the status they received in Germany, which includes social benefits, Tesfay and Dawit beg their friends in Israel not to leave for Rwanda – as long as they are not involuntarily deported. Their statements leave no room for doubt: “Increased removal” is another step in the abusive jailing and deportation of asylum seekers in Israel. For many of those deported it is a death sentence. Lior Birger is a PH.D. student in social work at the Hebrew University of Jerusalem and her field of research is immigration and refugees.